Once the documentation has been delivered to the UPV-ETSID. Procedure for the publication of an internship offer and the processing of Educational Cooperation Agreements. – Help document for the processing of internships in Spain. Curriculars can be done by undergraduate students with the first course passed, provided they are enrolled in the corresponding credits. Extracurricular, can be done by undergraduate students who have passed at least 50% of the credits of the degree. MASTER students can carry out practices from the beginning of their studies in the extracurricular modality and in the curricular modality whenever it is included in their curriculum. 2. Procedure for the processing of Educational Cooperation Agreements. 1.- If the company does not have a student: you can request the publication of an internship offer, this will be visible to the students of the chosen Degrees during a specific time. The daily dedication of practices is a minimum of 4 hours a day and a maximum of 8 hours. All external academic internships carried out by students of the UPV, will have a minimum amount of economic aid study bag that is marked by the Resolution of the Vice-Chancellor for Employment and Entrepreneurship of the UPV, of October 2, 2017. 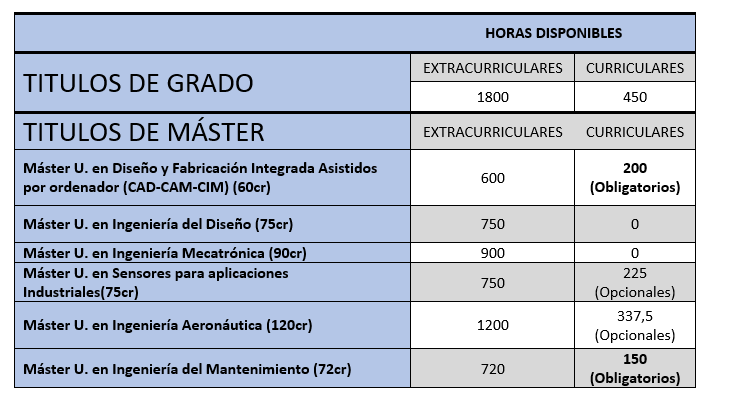 (the average of economic exchange for ETSID students who have completed internships during the last year are € 4 / Hour). At the moment we receive the internship application document, it is published on the website and is available to the students of the degrees requested, so that they can register for them. If the applicants meet the minimum requirements indicated in the offer, their CVs are sent, and it is the company which, according to their own selection systems, selects the student to perform the internship. Internships which start between JULY 26th and SEPTEMBER 10th, the month of AUGUST is non-workable. The internships that start between July 26th and September 10th, must be delivered no later than the 16th of July. For the completion of the documentation, the student needs a tutor in the ETSID – UPV, for which he has to contact one of his professors to consult his availability. The company must have a Tutor in Company responsible for supervising the student’s activities during the performance of their internship. In the FORMATIVE PROJECT, the list of activities to be performed by the student during the internship is collected. In NO CASE it will be possible to formalize a practice once initiated, or to process a practice delivered after the beginning of the same. The deadline for delivery of the documentation appears on the third sheet of the agreement of practices, if the documentation is delivered after that date we do not ensure that it can be processed in time. It is the responsibility of the student to meet the registration requirements required by current regulations, if not enrolled at the time of delivery of the practice, it can not be processed. The duration of the internship must coincide with the academic year, therefore the maximum date of completion of the practice is at most August 31st. If you want to continue with the internship after that date, you must sign a new agreement that will be valid as long as the student enrolls in the following academic year. 6. Once the documentation has been delivered to the UPV-ETSID. The Delegate Director of Entrepreneurship and Employment signs the documentation, by delegation of signature of the Rector of the UPV. A code and a link to the UPV documentation repository are sent by email to obtain the authentic copy of the practice. *This email is sent to the addresses provided in the agreement, so special care must be taken when filling in these sections. (Tutor Company and company representative) this same email is also sent to the student and the UPV tutor.